Many inquired about the color of Etude House I showed in some postings. Fairly many bloggers answered to them through replies and the bulletin board. It’s hard to explain with only one product so I did this posting….! Mac Nail Lacquer Mean &Green 10ml $ 12.70. It’s a brand new Nail Lacquer of Mac, which was released on late September or early October. It’s a limited edition so I don’t know whether it is still there. I feel little unfamiliar with it as I haven’t purchased Mac’s limited editions. At the time band new goods release, my teacher takes me to the store. I went to see Collection without any expect and it actually didn’t catch my eyes. It’s not my style and I had similar and half-the-price American products so I passed through it. It was released in three colors…which are similar to the color of blowfly! But all the color were so beautiful. I thought I couldn’t buy all of them, so I chose Mean & Green which is most similar to the color of Korean blowfly. It looks beautiful like a hologram, but it’s better when you actually see it. After base coat, I painted it for one time. It colors not clearly but lightly and the shining pearl looks attractive. Mean & Green is a purple color in green pearl? Or is it green color with purple pearl? The color changes according to the angle you see it. For me, it’s best to paint it once. Its color is not the one perfect or clear, but it looks unique. Painting twice makes this look. Painting twice with top coating. The nails inclined so their color looks green/khaki, but when they are vertical, the color look purple. Gold is also shown. After I purchased it, I tried it on nails of my friends…it goes well with nails in every color. It feels little different according to the skin toe, but it’s good. But what is important is, nails which bloggers requested are not these one. It’s not just a Mean And Green. The price of Mac Nail Lacquer is $ 12.70. I bought products with other ones so I don’t know whether I got a discount or not. I can’t find the receipt. Not all the colors released are good, some are country-like…but it’s good in price and the color is pretty. Hey, there’re products cost $ 1.69 or $ 2.54. The price is good, but it’s still over 5 times the other products. So I’m trying to use it up at least half. One of the methods is this. I didn’t intend to do so. After painting once, it was weak, so I thought it could be nice to mix it with other colors. After panting once, it felt a bit stained, but the color got way better after painting twice. The difference between 10 colors wasn’t that great. There are differences according to what you apply, how many times you apply, or how you apply. 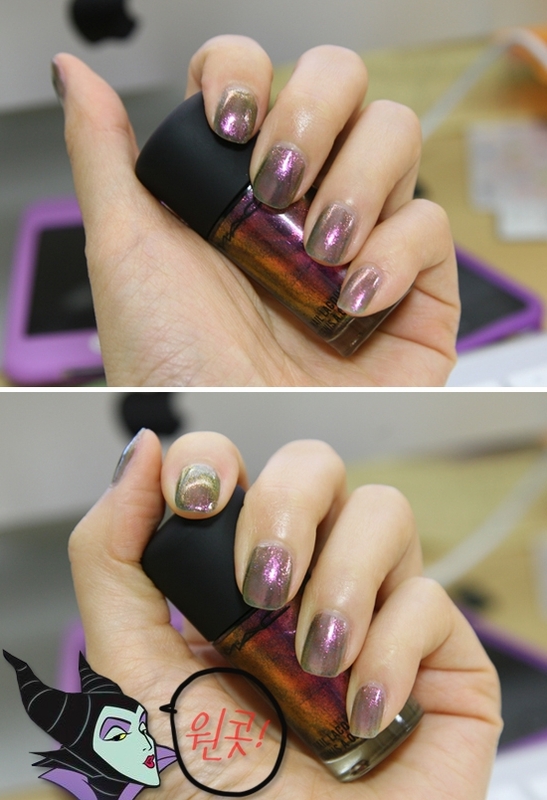 In last posting, the color caught bloggers’ eyes were Red + Mean & Green, which was painted on my thumbnail ^_^. My thumb nail was broken…so I painted a new color. All~ Red base. After painting base coat, paint Chanel Le Vernis Midnight Red color. Of course, the color doesn’t have to be this. As it is for expressing red for one-coat base, normal red is fine. After that, paint Mac Nail Lacquer Mean & Green twice over it. Then, what’s the difference between this and only painting Mean & Green? This makes red color more powerful than green. It gives luxurious feeling. I painted lines to express extremely luxurious feeling. There are some weird brushes...But it’s a quiet useful glitter considering its price. There are some colors but in my point, silver might be the most useful color. Most paint it on the edge of the nail, but I painted it on cuticle. In fact, I have small cuticle, but it’s good to hide cuticle. If the nail grows, paint just that part. It seems to be perfect for those who are not confident for self-nailing or having trouble with clean painting. Anyway, this ‘rich madame’ version is not what I usually wear, but it seems to be quite good when change is needed in my style. It seems I am acting like a Mac employee again following last eye shadow posting. The winner of this event is msn1110. Please leave your name, address, and contact number on the bulletin board. The sailing will be done this week. I appreciate all your participation although it is just a sample, not regular one. It is hard to tell there might be another event…as I can’t give you all.